Entire Riad 6 people in the heart of the Medina. 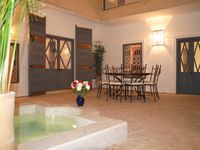 Property 26: Entire Riad 6 people in the heart of the Medina. Luxueux Riad Emilio - Marrakech. Property 31: Luxueux Riad Emilio - Marrakech. Luxurious Riad Emilio - Marrakech. 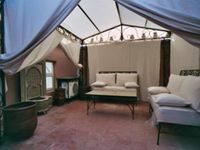 Property 34: Luxurious Riad Emilio - Marrakech. Host sent someone to pick us from the airport which was very considerate and thoughtful. The house is beautiful. Price is reasonable. There is a lady available at your service. Breakfast was served by her every am. For a fee, she makes for you traditional dishes for lunch or dinner. Internet was weak (I urged the owners to fix it)but we didn&rsquo;t mind since we came to visit the city.